When using our automatic payroll system, pay periods that contain payments larger than $10,000.00 will be partially paid. For example; if you have an unpaid amount of $9,000.00 for day 1 and $1,000.00 for day 2, then that payment will be partially paid because it reached the payment limit of $10,000.00 per transaction. The team member will get paid $9,000.00 first, the remaining $1,000.00 will be paid on the next payment attempt, which should be the following day. 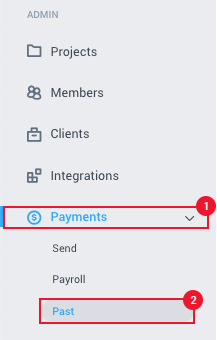 You should see what payments were partially paid by clicking on Payments-> Past on the left hand menu. Payment status will show as Partial paid. 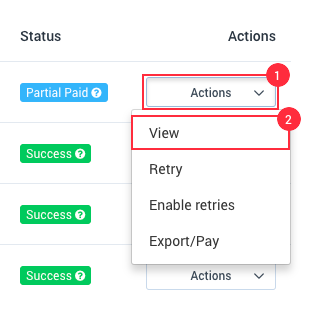 Click the Actions button and select View, you should see a detailed report for the partially paid payment and also when the remaining amount will get paid. For frequently asked questions regarding our payroll feature, please refer here.